When the potato famine hit Ireland in the 1800s, it left three million people dead. Three million. Because they were relying on one crop. Are you doing the same? Let’s take a few minutes and consider the “what ifs” of a total collapse… then see if we can beat them with a little planning. What If We Get Some Serious Climate Change? 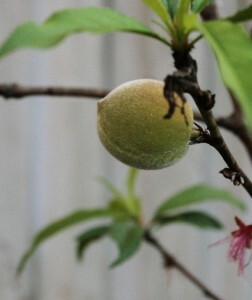 A mild winter allowed this “Tropic Beauty” peach to get a head start on its relatives with higher chill requirements. People have been worried about the climate for years. Whether you feel we’re shivering into a new ice age or sweating our way towards global warming, the climate is a fickle thing. It’s changed before – many times – trailing extinctions, shattered empires and starvation in its wake. How can you beat something so large? Annuals aren’t the biggest problem in a climate change scenario. Sure, you might get shorter summers that wipe out your corn… or rainfall that threatens to overwhelm your squash with mold… but it’s the trees that really suffer in a big shift. You can switch annual crops as needed but an orchard is a long-term commitment. Different fruit and nut species have specific requirements. Some don’t like too much cold… others need lots of cold or they won’t bloom at the right time. The wise gardener should plan ahead by planting a wide range of varieties in his garden. Just changing up your cultivars of one fruit can make a big difference. If you get a mild winter… your “Belle of Georgia” will almost assuredly fail to bloom in spring… and may not even wake up until summer. If you get a long winter, your Tropic Beauty is likely to bloom early and lose all its blooms to frost. Spreading your chill hour requirements that far apart probably isn’t necessary… but I grow trees here that have a range of about 150 – 500 so I can get fruit regularly. My Tropic Beauty peach now has peaches on it… but my Flordaking (a 400 chill-hour peach) has nary a bud. Look at your USDA growing zone and plant fruit and nut trees and varieties that grow further south and further north. Then you’ve got a cushion. I’m growing pears, oranges, papaya, chestnuts and even sweet cherries now. Some of these aren’t even close to being “proper” for my growing zone… but every year, as the climate swings back and forth, different plants that thrive and produce. What If We Get A Serious Pest Or Disease? 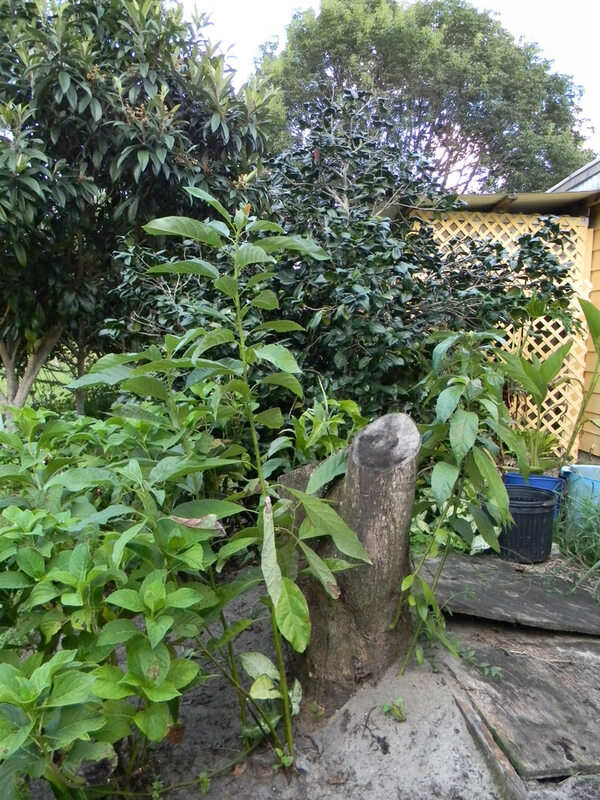 This avocado tree had all its above-ground growth killed by laurel wilt disease. 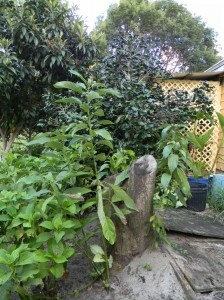 Now young shoots struggle to grow around the dead stump. If the Irish had balanced out their reliance on potatoes by maintaining another staple, there would be more redheads in the world right now (which would be a very good thing.) Unfortunately, their climate and relative poverty gave them very few options, the only alternative being small grains with relatively low yield compared to potatoes. What was needed was more diversity among potatoes. Lots and lots of varieties would have helped keep the blight from striking as hard as it did. I never plant one type of potato. In fact, three is usually my minimum. Again, you don’t know what will happen from year to year. The sure-fire crop for 2013 could be a flop in 2014. Here’s another example: for year, avocadoes have been an easy tree to grow in South Florida. Now, however, a wood-boring beetle has arrived carrying a fungus that can completely destroy an avocado tree – almost overnight. I’ve seen lovely trees that had all their above-ground growth knocked off by this disease of the laurel family. If you’re a farmer in Homestead counting on having an orchard of avocados to feed you in your old age and bring in some income… you may now be up guacamole creek without a corn chip. Nooo.... not my avocados! Is there anything we can do to prevent laurel wilt disease? Nothing that I've heard. It's the same beetles that killed your pecan tree. Well, it looks like there is some hope. I would gladly sacrifice a few lychee trees to keep my avocados alive.